Charlton Heston was to star as "John 'Eagel Eye' Pennell" in "THE LAST MAN CLUB," which was to be directed by his son, Fraser. 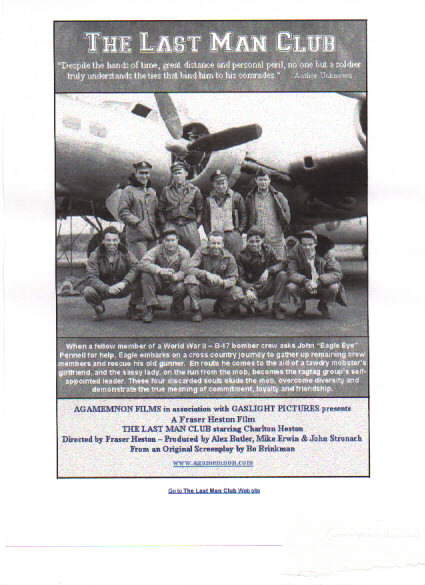 This independently financed film was about "four aging 'greatest generation' survivors of a World War Two B-17 bomber crew who get together for one last hurrah." Cameras were scheduled to start rolling late in 2001 throughout locations in Texas. Unfortunately, the financing fell through at the last minute and "Last Man" was never made. *"THE LAST MAN CLUB" was to feature flying scenes set aboard an original B-17 Flying Fortress; those scenes were to be shot at the Lone Star Air Museum in Galveston, Texas. A brief scene was to take place at the Vietnam Veterans Memorial in Washington, DC. THIS was to be the fourth time that FRASER HESTON had directed his father. Previously, he directed CHUCK in "Alaska" (1996), "The Crucifer of Blood" (1991), and "Treasure Island" (1990). +A Classic HESTON REJECTION: In 1971, Charlton Heston's very busy film schedule forced him to reluctantly turn down a leading role as a rugged outdoorsman in an adaptation of a popular contemporary novel. Upon its release in 1972, "DELIVERANCE" brought great acclaim and success for Burt Reynolds, playing what was originally Heston's role.